A few years back I was looking for recipes for nibbles for a cocktail party. I wanted tasty, savoury uncomplicated finger foods. Gougères kept popping up as a suggestion and although I wasn’t sure how gluten free choux pastry would work I decided to give it a go and I was surprised at how well it turned out. For some reason I didn’t make gluten free choux pastry again until this April when I decided I wanted some profiteroles. I sometimes get longings for light airy cream cakes, mille feuille, chocolate eclairs and the like and while I can make really good gluten free deserts there is something about the delicate nature of these cakes that I miss. I think Gluten Free baking can sometimes lack the daintiness of regular baking. I marvel at the elegant, intricate creations of good pastry chefs and I wish that I had the time or the money to spend my days perfecting gluten free adaptations of these creations and with the profiteroles I took a first and surprisingly easy step in that direction. 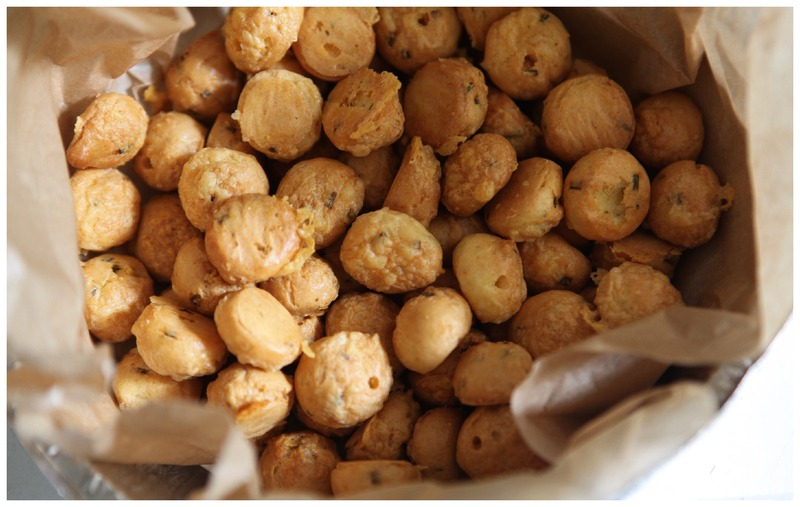 The profiteroles were incredible and I will post the recipe soon but this weekend I was looking for something savoury as I had offered to bring some hors d’oeuvres to a garden / balcony party and gougères seemed the way to go. Meltingly cheesy, with a slight kick of heat from the cayenne and a lovely oniony flavour from the chives, these were gorgeous. They are easy to make and importantly they were easy to transport. I took the recipe from David Lebovitz’s beautiful website http://www.davidlebovitz.com and very easily adapted it to make it Gluten Free. I also made my gougères a bit smaller, David Lebovitz recommends the pastry be piped about the size of a cherry tomato, I made mine somewhere in between a cherry and a cherry tomato as I wanted small cheesy morsels that people could just pop in their mouth. It is important to use a strong flavoured cheese when making gougères, I used a mix of gruyère, parmesan and a mature red cheddar just for a bit of colour. 3/4 cup grated cheese, I also kept the grater and the cheese nearby so I could grate some extra cheese over the gougères before they went in the oven. 3. Put the water, butter, salt and cayenne in a heavy bottomed saucepan over a medium until the butter has melted. 4. Mix the xanthan gum with the flour and add to the saucepan in one go and stir vigorously to combine the ingredients. The pastry will come together in a ball quite quickly. 5. Remove the saucepan from the heat and allow the pastry to cool for two minutes so your eggs don’t scramble when you add them to the pan. 6. Add the eggs one at a time beating them in quickly so they don’t cook in the heat. You pastry may have the consistency of loose scrambled eggs at this but don’t panic, keep working at the pastry and it will come together. 7. Add the cheese and the chives to the pastry and stir until well mixed, I switched from my wooden spoon to a whisk at this point and this definitely made the job easier. 8. Spoon the pastry in to a piping bag fitted with a wide plain tip and pipe the pastry out on to your prepared baking sheet. 9. You can smooth out the top of the pastry mounds by wetting the tip of your finer and pressing down gently. 10. Top the gougères with grated cheese and place in the oven for ten minutes at Gas 7 / 220c before turning the oven down to Gas 5/ 190c. The remainder of the cooking time will depend on the size gougères you piped out, if yours are cherry tomato sized than they should take 20 / 25 minutes if you go slightly smaller they will only take 15 minutes. 11. Remove from the oven and using a fine skewer pierce the gougères to allow any steam to escape, this will help to keep the pastry crisp. You should allow these to cool slightly before eating but they are best eaten when warm. If you make them in advance you could reheat them in a low oven for 5 to ten minutes before serving.